I remember celebrating Chinese New Year. While my friends didn’t celebrate it, my family made it special. Dennis, my dad, came home early from work, and my godparents, Anne and Donald, drove down from Vancouver. Kristy, my mom, laid out a red tablecloth on top of Grandma’s oval, claw-foot oak table, a 100-year-old heirloom. On this day, our house transformed. Mom hung crimson paper bearing Chinese characters laced in gold, which colored a formerly empty wall. 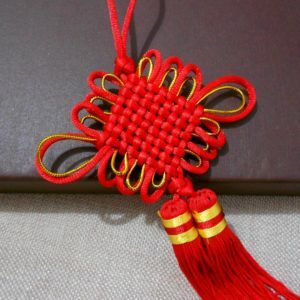 Knot ornaments, the traditional bell, and a paper dragon coiled the dining room curtain rod. The entryway smelled of incense. We ate red barbeque pork slices with hot mustard, stir-fry chicken, red bean paste buns, yakisoba noodles with cashews and red bell peppers. The next day it was over. Where the red had been, now lay a white lace tablecloth. Mom sat at the table, reading Wilson’s 100 Cupboards. Beneath her feet, down in the garage, Dad tinkered underneath his 1930s Ford hot rod. Channel 8 played in the background as I ate my favorite TV dinner, chicken alfredo and garlic bread. With fork and knife in hand, this was home. Because chopsticks never felt right between my fingers. We only used them once a year and then tucked them away in a kitchen drawer, buried underneath plastic forks and knives, oven mitts and hot mats. And I never knew what the Chinese characters meant either. They would appear for one day a year and then disappear into a box. My name is Ivy and I was born in Fuzhou, Jiangxi, China. I don’t know who I am or where I came from – and I wasn’t left a note. The orphanage gave me the name “Fu-HuiHong.” When Mom came to get me, I was being raised by an old Chinese woman in a humble room. And I cried when she took me away. At seven-months-old, I was whisked away to America and lived in Beaverton, Oregon for the next 18 years. When I talk about my identity, I say it in a roundabout way because I don’t even know how to explain it to myself. When I look in the mirror for too long, I get confused and dismayed. I remember high school, the questions about who I am or what I am and the constant pressure to give an answer. And I give one. It satisfies people, while I feel reduced. How do I explain what it means to be me? How do I describe what it feels like to look in the mirror and not even register my face as Chinese? How do I tell people that I feel foreign to myself at times? I have so much more to say and so much more to give. My story makes me laugh and brings me to tears; it is both hopeful and confusing, authentic and foreign. Someday, I hope that I can better articulate it, honor it, and present it in its fullness. For now, I’ll seek to not define it, and instead, cherish its complexity and blur the line between the world and me. Bio: Ivy is a member of the Field Team of APANO, Asian Pacific American Network of Oregon. She recently graduated from Willamette University with a bachelor’s degree in politics, history, and a minor in American ethnic studies (AES). During her time at Willamette, she was a library student manager, the university archives intern, a mentor to first year students, and a Sexual Assault Response Ally (SARA) on her campus. She also interned for State Representative Susan McLain and later became her legislative assistant for the 2018 session. For her theses, Ivy wrote about her passions for social justice by highlighting Chinese exclusion in Oregon and the politics of the #MeToo movement. She hopes to continue work in non-profit, helping to promote social justice, civic engagement, and empowerment. She currently volunteers at the Center for Hope and Safety in Salem, Oregon.